From the bestselling author of The Drunkard’s Walk and coauthor of The Grand Design (with Stephen Hawking), a startling and eye-opening examination of how the unconscious mind shapes our experience of the world. Over the past two decades of neurological research, it has become increasingly clear that the way we experience the world--our perception, behavior, memory, and social judgment--is largely driven by the mind's subliminal processes and not by the conscious ones, as we have long believed. 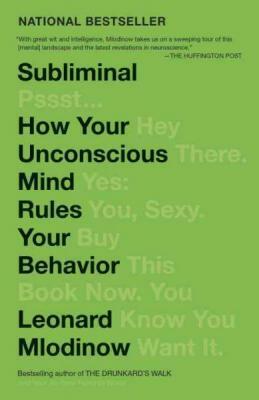 In Subliminal, Leonard Mlodinow employs his signature concise, accessible explanations of the most obscure scientific subjects to unravel the complexities of the subliminal mind. In the process he shows the many ways it influences how we misperceive our relationships with family, friends, and business associates; how we misunderstand the reasons for our investment decisions; and how we misremember important events--along the way, changing our view of ourselves and the world around us. Leonard Mlodinow received his PhD in theoretical physics from the University of California, Berkeley, was an Alexander von Humboldt Fellow at the Max Planck Institute, and now teaches at the California Institute of Technology. His previous books include three New York Times best sellers: War of the Worldviews (with Deepak Chopra), The Grand Design (with Stephen Hawking), and The Drunkard’s Walk: How Randomness Rules Our Lives (also a New York Times Notable Book), as well as Feynman’s Rainbow and Euclid’s Window. He also wrote for the television series MacGyver and Star Trek: The Next Generation.